Moscatel is a sweet Spanish wine but you could also make this fragrant, fruity pudding with Sicilian marsala wine. 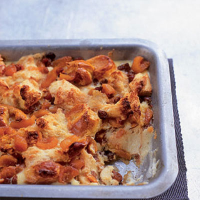 Put the apricots, sultanas and moscatel in a small pan. Bring to the boil then remove from the heat and leave to soak for at least 2 hours or overnight. Put the cream and milk in a pan with a pinch of salt. Bring to the boil. Remove from the heat and add the vanilla. Beat the eggs, egg yolk and sugar together. Pour the warm milk and cream mix on to the egg mix, stirring all the time. Rip the brioche into chunks, spread with the butter, and arrange butter-side up in a 2-litre oven dish, mixing in the soaked fruit and moscatel as you go. Pour on the egg-and-cream mix through a sieve. Rest for 30 minutes; this makes the pudding lighter. Try to cover the fruit with the liquid or it may burn, and push the brioche under the liquid as far as possible. Put the dish in a roasting tin. Pour boiling water into the tin, to halfway up the dish's sides. Bake for 40-45 minutes, or till golden and set on top. Cool slightly, dust with icing sugar and serve with crème fraîche. This recipe was first published on Waitrose.com in February 2006.